I don't know what memories "cabbage" might conjure up for you but I can certainly never remember being too excited as a kid when it turned up on our family table...cooked beyond any recognition of its former crispy and colorful self. I remember my grandmother made a tasty coleslaw which I really enjoyed but "cooked" cabbage just always seemed so very "blah" to me. Then again, I wasn't entirely excited about many cooked vegetables until I left my teens. And, more importantly, until I discovered that they didn't all come out of a can! 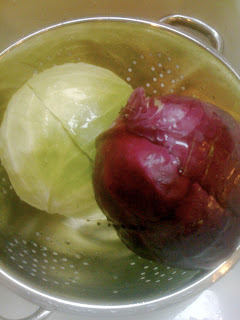 While I have had good stuffed cabbage rolls and now use cabbage in soups quite often, I think I still prefer it raw. That being said, seasoning is essential to making it go from ho-hum to yum-yum. The added benefit of cabbage is that it not only stores great, it's available year-round and is very economical. The two little heads pictured above, just waiting for their "makeover", cost less than $1.50 per pound (New Seasons) and they'll make quite a heap of slaw. Best of all, cabbage is loaded with both vitamins K and C and is touted as one veggie with a host of health benefits. Do a little internet search to learn more...these humble heads get some quite impressive press. Oh...and just one more little tidbit of information I just learned in case you find yourself purchasing those oh-so-handy, prepackaged, and pre-shredded bags of cabbage...apparently, once you cut or shred cabbage, it immediately begins to lose its vitamin C content. So keep it whole until you plan to use it if you want to maximize its healthy punch. I particularly like raw slaws that have really fresh flavors that pop with lime, cilantro, green onions, etc. All ingredients that pair well with, and enhance the flavor of, raw cabbage. A while back I discovered a couple of recipes that I really think are worth sharing. First is a Fish Taco and Cabbage Slaw recipe that is really good but shines even more due to the versatility of the slaw itself. In addition to making these tacos super tasty, this slaw pairs really well with grilled chicken or, in a pinch for a quick meal, simply stuffed into cheese quesadillas or a sandwich. It's kind of become my little "go to" slaw of late. 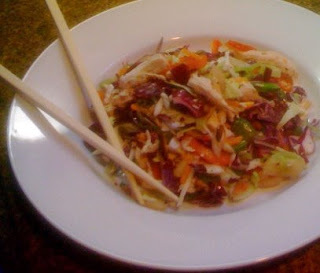 The other slaw recipe I really enjoy is Asian Chicken Slaw, which I adapted from an old Cooking Light recipe. It, too, has a lot of really fresh flavors and a light soy/sesame dressing. With the weather here in Oregon into the 90's this week, this particular dish is a very refreshing alternative to grilling, and it's a complete meal with shredded chicken tossed in. 1. Combine first 5 ingredients (through cilantro) in a large mixing bowl. Add juice, 2 tablespoons oil, and 1/4 teaspoon salt. Toss well to combine. 2. Sprinkle fish evenly with chili powder and 1/4 teaspoon salt; set aside. Heat remaining 1 tablespoon oil (add a bit more if necessary) to a non-stick skillet over medium-high heat. Add fish to pan; cook three minutes on each side or until fish flakes easily with a fork, or until desired degree of doneness. Remove fish from heat and break up each fillet with a fork so that you have roughly bite-sized pieces for your tacos. 3. Warm tortillas according to package directions. (I have a gas cooktop and simply place them right on the burner, much to my family's concern as they fear me searing more than the tortilla. Definitely use caution if you go this route. I just love the little burnt tinge they get using this method. But, again, don't completely throw caution to the wind...they can catch fire, so be mindful). 4. Spoon about a 1/4 cup of slaw into each of your eight tortillas. Divide fish evenly among tortillas, fold in half and serve with fresh cut lime wedges. Super good...super easy...and super fast! This is a great meal when you only have, or want to spend, 20 minutes getting dinner ready. The time is really in the prepping of the slaw ingredients and even that doesn't take too long. If you want to make the slaw earlier in your day, just cover it with some plastic wrap and pop it in the fridge until you cook up your fish. This way you'll cut your dinner prep to just minutes! I always seem to have left-over slaw with this recipe. See how it works for you. Depending on how much you use in your tacos, you might as well. If not, you'll want to increase the recipe because having leftovers is definitely the added perk in making this slaw. And, if you're looking for a great grilled chicken recipe to pair along with your leftover "go-to" slaw, you may want to take a peek at Isabel Cruz' Chicken Diablo, from her cookbook Isabel's Cantina. It's simply bone-in, skin-on chicken marinated in a combination of mustard, lemon juice, olive oil, and chili flakes (best left overnight in the fridge to let the flavors mix and mingle), and then grilled. One word of warning, however, if your BBQ is near your house, you may want to move it out a bit. "We" smoked the side of our garage on our first run through. Two weeks later, siding repainted and BBQ pulled a safe distance onto the patio, we made it again. It goes so great with this slaw. And, as an added little punch, I serve a tomato salsa along side...actually in several cups around the table so everyone can get as many spoonfuls as they want. I tend to use a lot! Isabel's Basic Salsa, also in her book Isabel's Cantina, is a really good and super easy salsa to make, if you're interested. It's just a quick blend of canned plum tomatoes, jalapeno, onion, garlic, cilantro, lime juice and salt. You may want to give her book a peek. It's an interesting fusion of Asian and Latin cuisines...all flavors that I love. No...I'm not getting any royalties here...just passing on a good find. At the risk of getting altogether too long-winded in today's posting, I have to pass on this last last recipe for Asian Chicken Slaw. It's just a really good, fresh, and easy meal that truly reinvents that ho-hum cabbage. This one is posted especially for my daughter, Danielle, who is quickly becoming quite the little chef in her own right. Though you've got a bit of dicing and slicing up front, it's well worth the effort and comes together quickly in the end. And...it's great the next day, too! 1. Combine first 8 ingredients in a large bowl. 2. To prepare dressing, combine cider vinegar and next 7 ingredients, through black pepper, in a small bowl and stir with a whisk. Pour dressing over slaw and toss to coat. Cover and chill for at least 1 hour (I've skipped this step when time just didn't allow for a pre-chill and the salad is still great. Letting it sit and chill for an hour, however, does give the flavors a chance to meld; so if you have the time it does enhance the flavor). 3. Sprinkle chilled slaw with slivered almonds and sesame seeds; toss and serve.